Minibridge is a simplified form of bridge. Starting from dealer, players declare the number of points in their hand A -4, K-3, Q-2, J-1. The pair with the greater number of points play the hand, the individual with most points in the partnership is declarer, partner is dummy. Dummy puts his hand down, declarer decides whether he /she isplaying in game or part score and whether it is a suit contract or NT. If a suit, dummy puts suit on left hand side. Player to left of declarer leads for first trick. Scoring is as for bridge except all scores are non vulnerable. 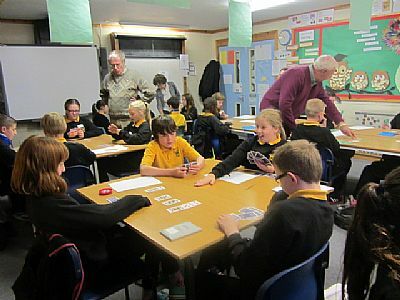 This course is aimed at primary 6/7 children and has successfully been taught in classes in curricullum time. We have been offering 8 week courses in some schools, longer in others. However you could use it to help your grandchildren to learn to play mini bridge. We also need more people to volunteer as tutors for 8 weeks per year.